It’s been a long, long day. I’m tired and a bit incoherent so this tale will ramble I’m sure. A few days ago, word started to trickle in that one of the horses that my boss bred, raised, and raced had turned up in very bad circumstances along with several other Thoroughbred mares. Wise Affair was Exclusive’s first foal. She was the best racehorse of all of Exclusive’s kids in fact. 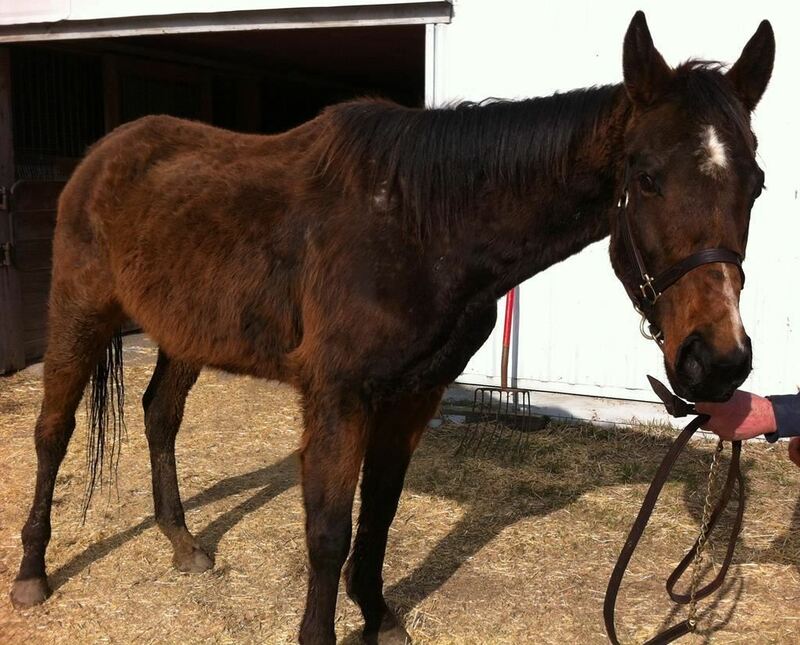 After racing, she went to another owner as a broodmare. There were serious complications from her first foaling (prolapsed uterus, a rectal tear, etc) and after a very long and difficult recovery she was given to a “good home” as a companion horse. They were told that she was not breeding sound. Those owners bred her anyway. Repeatedly. They also seem to have neglected to feed her. She has a uterine infection of some kind as well as a tear. She has oozing patches of skin, almost no tail, and scabs and scurf everywhere. We haven’t yet checked for lice, but that’s a possibility for sure. Undoubtedly she’ll have worms. 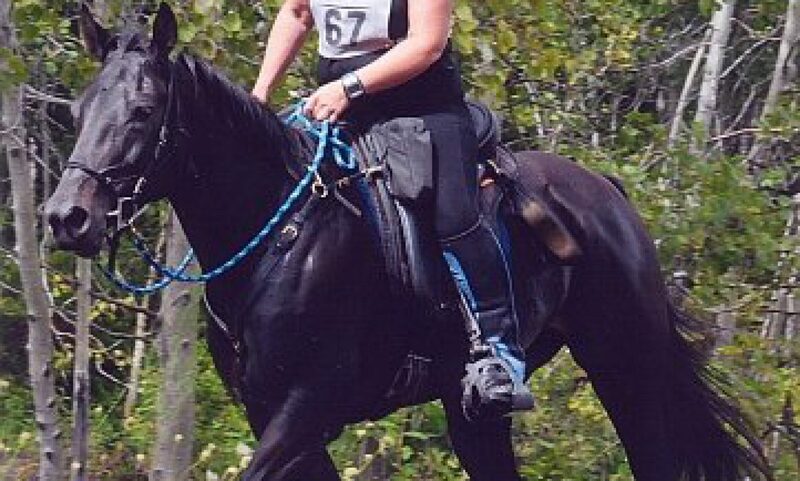 In case you’ve never seen it, this is what a horse looks like when they are graded a body condition score of “1”. It can be hard to see in photos when they have a long coat. But click on the photos to get a closer view. Canter On Equines were working with the owners to get all three mares placed. Linda and I went up with my truck and trailer to get her today. Because the owners were actually (with quite a bit of encouragement) willing to surrender the horses, we did not say anything overt to them about how dreadful the horses looked. (The owner seemed to think the horses were fine and that since the OSPCA inspectors had been around and said they were fine, that all was well. Sure wish I knew exactly how the OSPCA justifies their own existence.) I really couldn’t say a word to the guy, since anything that might come out of my mouth would have been confrontational. So I just took poor Weezy (they had renamed her Shayna, but there is no way we are calling her the name they picked – she goes back to being Weezy) straight on the trailer. She didn’t even break stride… marched right up that trailer and snatched an entire bale of hay out of the next stall, flinging up in the air in her enthusiasm. I managed to jam that back into place, and gave her a fully stuffed hay bag to eat on the way home. Once back at the farm I opened the trailer door to discover Weezy with the empty hay bag on top of her head, looking cheerful. She hopped off the trailer and went right over to see the boss. He held her while we took photos, and she rubbed her head all over him quite rudely… as she had always done to him at the track. She definitely knew where she was and who she was with. She’s now in a clean stall with a big pile of hay and lots of water. The vet is coming to see her on Monday. 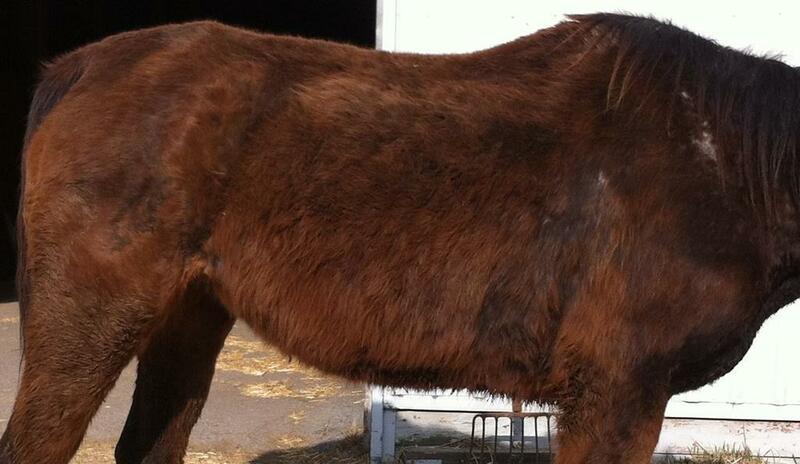 We have stocked up on alfalfa, beet pulp, flax, oil, and vitamins for her. Special thanks to Canter On Equines who did a great job finding homes for all three of the mares. And for lots of other horses too. It’s a good thing there are people like them in the world. Because there’s just way too many of the kind that have owned Wise Affair for the last couple of years. Lucky lucky lucky girl to be rescued by you!!! Shame on people that treat horses like this. A pox upon them.